PTM1433 : 14.4 volt 2200mAh Ni-MH battery pack for MAKITA cordless power tools. Home > Cordless Power Tools > PTM1433 : 14.4 volt 2200mAh Ni-MH battery pack for MAKITA cordless power tools. 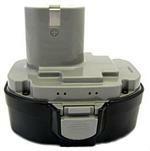 PTM1433: 14.4 volt 2200mAh rechargeable battery pack for many MAKITA cordless power tools. Made with long life, memory-free Nickel Hydride cells. Compatible with the following model numbers for MAKITA: 1051D, 1051DWD, 1051DWF, 1422, 1433, 1434, 1435, 1435F, 192600-1, 192699-A, 193158-3, 4033D, 4332D, 4333D, 4333DWDE, 5094DWD, 5630DWD, 6228D, 6228DWAE, 6228DWBE, 6233D, 6233DWAE, 6233DWBE, 6236DWBE, 6236DWDE, 6237D, 6237DWDE, 6237DWDLE, 6333D, 6333DWBE, 6336D, 6336DWB, 6336DWBE, 6336DWDE, 6337D, 6337DWDE, 6337DWDLE, 6337DWFE, 6339DWDE, 6932FD, 6932FDWDE, 6935FDWDE, 6935FDWDEX, 8433D, 8433DWDE, 8433DWFE, JR140D, JR140DWB, JR140DWBE, JR140DWD, ML140 (Flashlight), ML143 (Flashlight), UB140D, UB140DWB, etc. 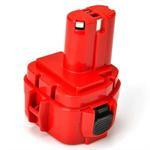 CT-6M: 7.2v 1700mAh rechargeable battery pack for Makita cordless power drills. Fits the Makita 6019DWE, 7000, 7002, 7033, 191679-9, 192532-2, 192695-4, 632002-4, 632003-2. 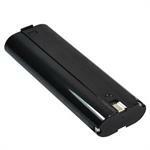 CT-8M: 9.6v 2000mAh rechargeable NiCd battery for cordless power tools. Replaces battery #s 9000, 9001, 9002, 9033, 9600, 632007-4, 191681-2. PTM1220 : 12 volt 2000mAh rechargeable Ni-Cd battery for MAKITA cordless tools. The PTM1210 is a 12 volt 2Ah rechargeable Ni-Cd battery for MAKITA cordless tools. Replaces MAKITA model #s 1210 & 632277-5. Fits 5092D, 5092DW, 6011D, 6011DW. PTM1233 : 12 volt 3.0Ah Ni-MH battery pack for MAKITA cordless power tools. PTM1233: 12.0volt 3.0Ah Long life rechargeable NiMH battery for MAKITA cordless power tools. See full x-ref list for compatability.